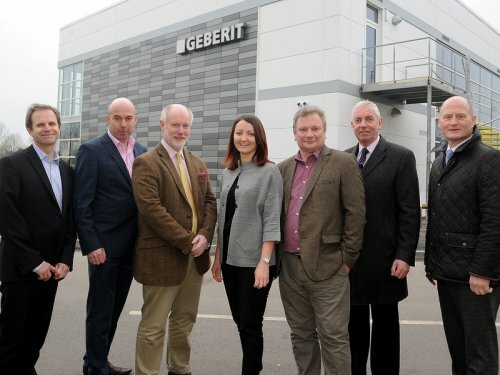 Following a £6 million investment, Swiss sanitary product supplier Geberit has moved into its new state-art-of-the-art UK Headquarters in Warwick. The newly-built offices at Tournament Fields are double the size of the company’s original building and will the base for 82 business, marketing, IT, HR, R&D, customer support and sales employees. The work on building was undertaken by Tournament Fields owner Sackville Developments, part of the CWC Group, and saw the creation of a 25,000 sqft building. The design incorporates the growth of Geberit following its recent acquisition of Staffordshire business Twyford and allows for future expansion. Geberit UK Managing Director Mark Larden said: “We are incredibly excited to take up residence in our new headquarters and this definitely marks a significant milestone in our company development. “It was only eight years ago that we moved into our other purpose-built building on Tournament Fields, having relocated the business from Kent. However, thanks to our strong growth trajectory we outgrew that premises in just a few short years and we were more or less bursting at the seams just before we moved. To ensure the company could make the most of the opportunities the larger headquarters offer, EHB Commercial assisted Geberit in securing the building but have also negotiated the disposal of their former impressive headquarters. Simon Hain has worked as a commercial property consultant in Leamington Spa since 1984 and has been very active within the local community and is a former chairman of Leamington and District Round Table and trustee of various local charities. Simon specialises in Commercial Agency, Development, Acquisitions and Corporate Property Advice and is a director of ehB Reeves. Nick is a Chartered Surveyor who has worked in Leamington Spa since 1992. Born in Warwick, Nick is a Fellow of the RICS, Registered Valuer, RICS Accredited Mediator and former Chairman of the RICS Coventry and Warwickshire Local Association. Nick generally concentrates on Valuation and Professional / Landlord and Tenant work as well as Investments and Corporate Property Advice for clients and is a director of ehB Reeves. Scott is a Chartered Surveyor having worked in general practice surveying in the West Midlands area since 1991and mainly within the Coventry and Warwickshire area. He has a wide range of experience dealing with commercial property matters including professional valuation services for private and corporate clients, other professional work including rent reviews, lease renewals, business rate appeals as well as commercial agency investment acquisitions and disposals. Scott is a director of ehB Reeves. Stuart heads our property management department working closely with clients to maximise returns from their property assets. He advises a number of private investors, high net worth individuals, property companies, pension funds and organisations with a charitable status, dealing with all aspects of the management of their property investments. Stuart is a Chartered Surveyor with over 25 years’ experience in Landlord & Tenant and general practice work in the West Midlands and Warwickshire. He joined Reeves & Partners in 2001 and is a Director of the firm. Robert is a Chartered Surveyor with extensive experience in the property business, having worked on both sides of the fence, as adviser and client, in all market sectors and on properties and portfolios large and small. He enjoys dealing with all aspects of commercial property and acting for all types of client. Jon is as newly qualified Chartered Surveyor. Having graduated with a BA (Hons) degree from Sheffield University Jon started his career in Residential Agency whereby he became a member of the National Association of Estate Agents and subsequently also successfully completed a BTEC in Residential Lettings Management. Having made the transition to commercial property , he started out as an office agent in Birmingham focusing on both the city and out of town markets. Areas Jon cover include: Commercial Agency, Development and Acquisitions . Having joined Reeves & Partners in 2011, Phil has over 18 years’ experience in the Property industry specialising in Commercial Property Management. Phil works closely with a wide range of clients including private investment companies, pension fund operators and religious organisations advising on all aspects of Property and asset management. Phil is an experienced and valued member of the Property Management team and has acted across a wide range of property sectors including residential, industrial, office and retail. Outside of the office, Phil enjoys music, reading and Formula One. Nigel is a Chartered Surveyor with over 40 years' experience in General Practice. Originally with a background in commercial property he has for many years concentrated on providing general consultancy advice to his many charity clients throughout the UK, occasionally involving properties in Ireland, France, Belgium and Italy. Nigel’s work covers a wide range of activities associated with charity owned properties which include the sales and acquisitions of substantial Estates, of properties in the healthcare and education sectors as well as development land and conventional domestic residences. Formerly based in the City of London, Nigel joined Reeves & Partners in 2010 adding his many clients to the firm's already substantial charity client base. Sam started work in asset management department, working as a graduate asset manager and will soon be starting his assessment of professional competence (APC) - the on-the-job training scheme graduates need to complete to qualify as a chartered surveyor. Sam grew up in Warwickshire and attended Warwick School and outside of work, he enjoys playing golf and football and is a Coventry City supporter. ehB Reeves is a dynamic professional firm of Chartered Surveyors, Commercial Estate Agents and Commercial Property Consultants in the West Midlands, offering experience across all sectors of the commercial property market.